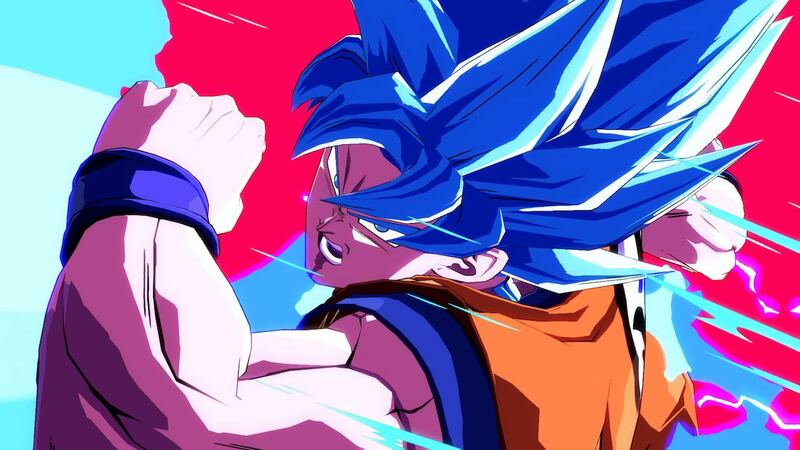 Nine months since its initial release, Dragon Ball FighterZ seems to be making quite the impact within the fighting game community. Not only has it had one of the best competitive sets of the year between the dominant GO1 against EVO Super Smash Bros. Melee winner Luffy, but it also managed to demolish spectator viewership records at EVO too. Well, the fans have asked for it and now it is about to become a reality as the Super Saiyan brawler finally Ki blasts its way onto the Nintendo Switch. For those that haven’t played Dragon Ball FighterZ before, here’s a quick rundown on how the fighting mechanics work. Two teams of three fighters battle it out until there is only one team left standing. You have your primary character that you control, while the other two members of your team wait it out until they are either tagged into play or used as a tool for an assist attack. The character in play has a light and medium attack that can be mixed up to enforce simple spammy auto-combos. The heavy attack works as a launcher to send your opponent soaring across the screen or high into the air. Give the heavy button another bang and you will instantly chase down the soaring opponent into a possible team-swapping aerial combo. When it comes to special moves, there’s a dedicated button to use that can have different outcomes depending on command inputs. These inputs are rarely any more complicated than a quarter-circle roll with the Left Stick or D-Pad. If you want to simplify it more than that, then there is also a simple control option that’s exclusive to the Nintendo Switch version where pressing the shoulder button with various face buttons will execute a similar outcome. If you want my advice, you’re best of just sticking with learning the standard control set up. They’re still easy enough to learn and won’t handicap you should you happen to play it on other consoles. Other fight mechanics include a Vanish attack to surprise your opponent from behind, a Super Dash to rapidly close the distance, and a Ki charge for your character to quickly summon meter on the spot – which can leave you massively wide open as a result. In combining various buttons together and simple input commands, the player can employ much larger and flashier meter-draining moves to end a combo with more bite. Finally, the Dragon Rush attack is a move that has similar properties to a conventional throw in fighting games. However, the exception to the rule is that it doesn’t actually throw the opponent, but rather works as a free combo starter if landed correctly. It can all sound quite overwhelming with a lot to take in, especially considering there’s even more to the universal mechanics beyond what I have noted above. In any case, most tools are very easily accessible with single dedicated buttons moulded around the controller. It should only take a few rounds to start grasping the underpinning fundamentals to get you started. The simplicity of knocking out flashy moves can make a beginner feel like a badass, while the more seasoned competitor still has a Bible-sized amount of depth to unravel between their fingertips. Between players with a certain skill level, a fight of the 2.5D brawler can last up to five minutes long depending on how close you are to running out the clock. The great thing about the length of each fight and the way damage is handled is how it can cause a lot of back and forth drama between rivals. To see one of your characters get completely owned one moment, to then seek revenge in spectacular style the next in the same match, not only feels extremely rewarding but also fits perfectly in accordance to the highly popular anime series. The fast-paced fighter has plenty of extra content to dive into, including a rather ambitious story mode that impressively looks visually on par with the long-running anime. There are three story arcs to complete which blends together fighting games with traditional board games and stat-boosting RPGs. While the concept works as an excellent way to introduce brand new players to the game mechanics, it can also feel like the mode is insulting the player’s intelligence in how incredibly easy the first arc is. Each arc can take a few hours to complete, which, in turn, can make the first few hours an absolute grind to get through. The difficulty does eventually very slowly crawl up, but the early simplicity of it all can be enough to put many off from wanting to see it through. Besides a cinematic story, there are a few standard offline modes to sink your teeth into. You have your basic combo tutorials to get to grips with your favourite character, an Arcade Mode that will grade you on your skill, and a local battle setup that can see up to six players teaming up and settling scores. The good news is that the Nintendo Switch is on par with the latest updates to other consoles, so all the new features, modes and balance updates are present with this release. That includes 1-vs-1 and 2-vs-2 battles to shorten up the matches and provide a slightly different tactical approach. Considering that probably 97 percent of Nintendo Switch owners play over a Wi-Fi connection, the online experience seems to run pretty well for the most part. Under a solid connection, I’ve had good matches with a fair few players and little lag. There does seem to be a few teething problems with the ring matches and lobby count, but nothing that hinders the overall experience too much. The online is very important here as it obviously fleshes out the game’s longevity. It’s good to see a lobby structure that works conveniently both in customisation and accessibility, then. Besides your usual ranked and casual options, there’s a Party Mode where six live players can clash bones across two teams of three. It’s a cool idea if a little more risky if you are looking a fight with a decent connection. For those reading this who are accustomed to Dragon Ball FighterZ already, will probably want to know how good the Nintendo Switch version actually looks and plays. Well, besides a few small cosmetic sacrifices, the game still handles and presents itself wonderfully well indeed. Fights play out at 60 frames per second while keeping most of the glitz and glamour that made the PlayStation 4 and Xbox One counterparts look so outstanding in the first place. The 3D models do an impressive job at looking like a 2D anime with dynamic camera angles and masterful use of cell shading. The backgrounds don’t look quite as impressive as they do on other platforms, but the destructible environments and destructive finishes still remain spectacular. Where things can begin to get a little steep, is when you bundle in the Season Pass on top of the asking price for the core game. The Nintendo Switch version of Dragon Ball FighterZ is, after all, a great way to get some practice in when you’re out and about. However, for those double-dipping the Nintendo Switch version will still expect that you pay another £30 to play as the additional eight characters. It would have been nice to have seen a gratis addition of the first Season Pass with the Nintendo Switch release. The inclusion would surely help to persuade more players to commit to a second purchase. After all, there’s an inevitable chance that a second Season Pass will be announced in the near future, which can quickly prove to become quite costly for a current fan when taking everything into account. It’s fantastic to see that Dragon Ball FighterZ transitions as well as it does to the most versatile games console on the planet. The game looks and plays great on the portable home console and stands as one of the best and most faithful anime licensed titles on the market. Dragon Ball FighterZ is one of those rare brawler’s where the simplicity doesn’t get in the way of depth. There’s a lot of possible mind games to play out with plenty of drama and upsets to keep the action incredibly addictive. Kakarot and the gang may be late to the Nintendo Switch party, but the wait was well worth it in the end.